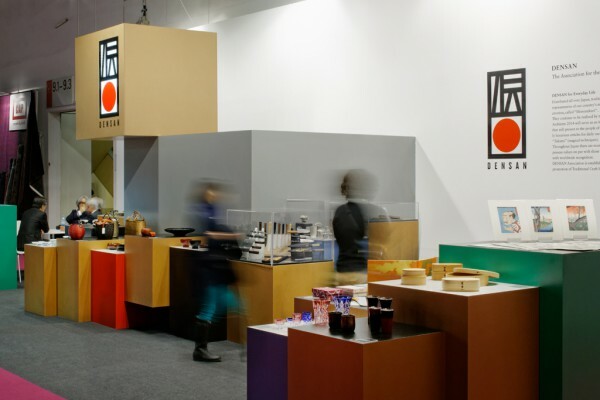 WORKS / ambiente 2014 "DENSAN"
We set up the exhibition areas for the Association for the Promotion of Traditional Craft Industries (DENSAN) during the Ambiente international trade fair for consumer goods held every year in Frankfurt, Germany. 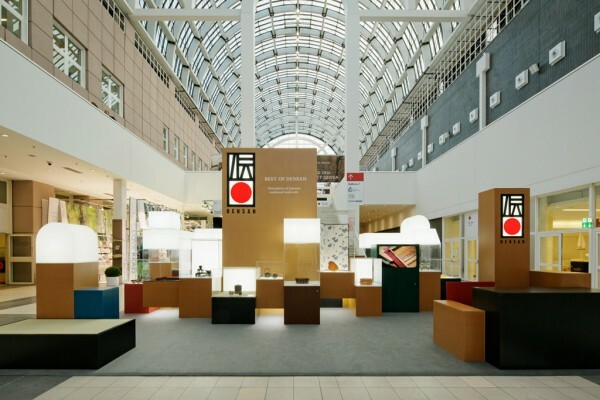 We were tasked with creating an unmistakable presence that will catch the eye of many visitors in order to share the beauty of the traditional crafts of Japan with the world. 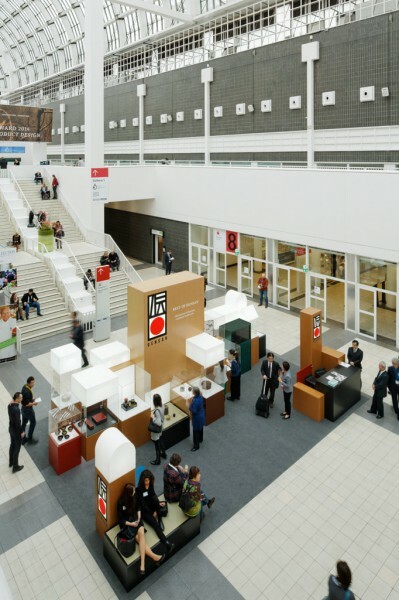 The exhibition areas are located in two distinct sections of the venue. 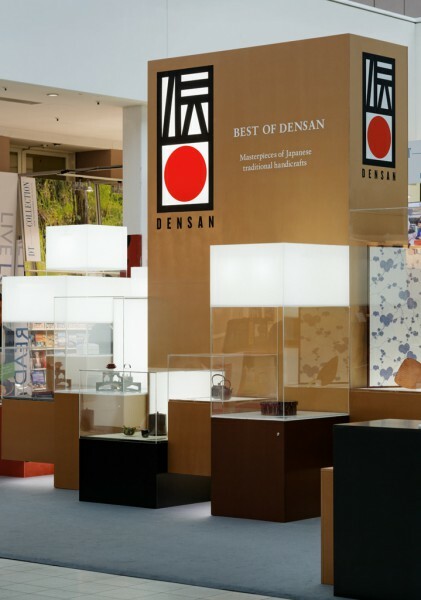 The first area, named BEST OF DENSAN, is found in the Galleria and showcases about 20 traditional crafts from Japan. 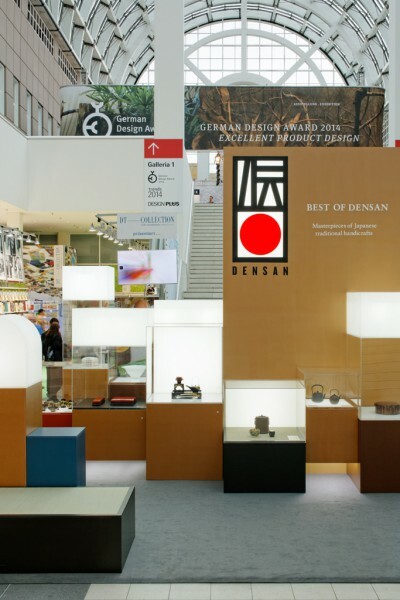 The second area, named DENSAN for Everyday Life, is found in Hall 9.0 and showcases everyday use products from 19 organizations. 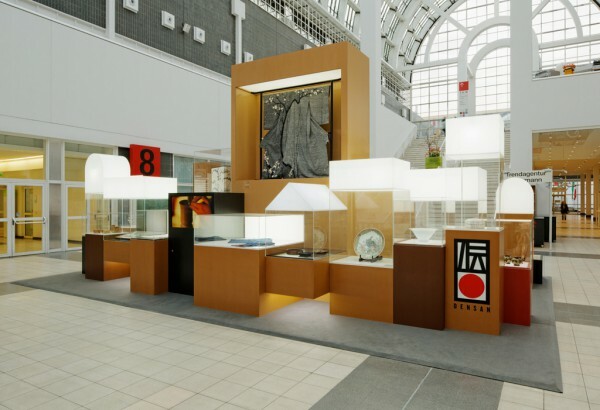 The Galleria is an atrium with a high ceiling that serves as a cross-point where visitors come and go. 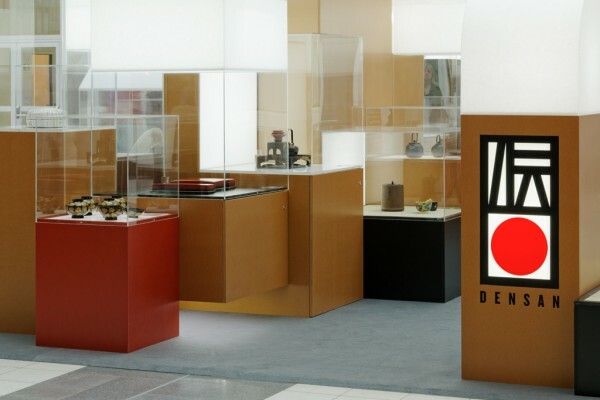 We adopted the plane configuration of a long and narrow island in order not to impede the main line of flow, while at the same time placing the display fixtures in the center at a height that meets the eye. 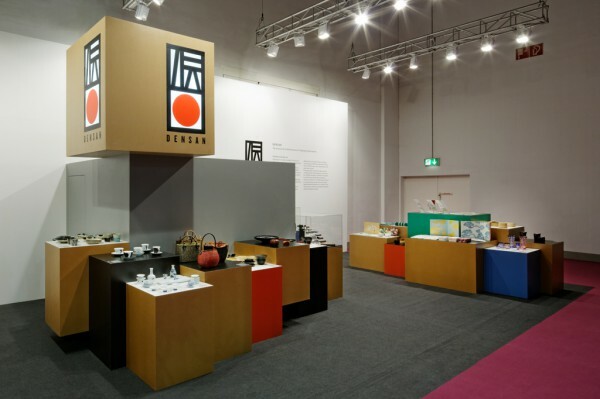 In order to carefully present the individual objects, we prepared separate display stands and decided on the most suitable lighting and height/color of stand for each of them. 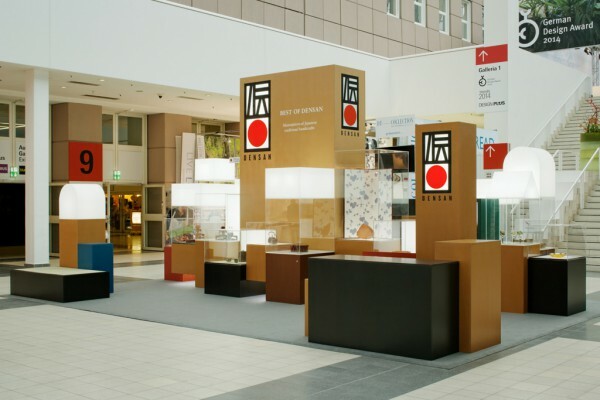 Furthermore, we harmonized the materials of the display stands with traditional Japanese tones using colored MDF boards as effect color on an MDF base. 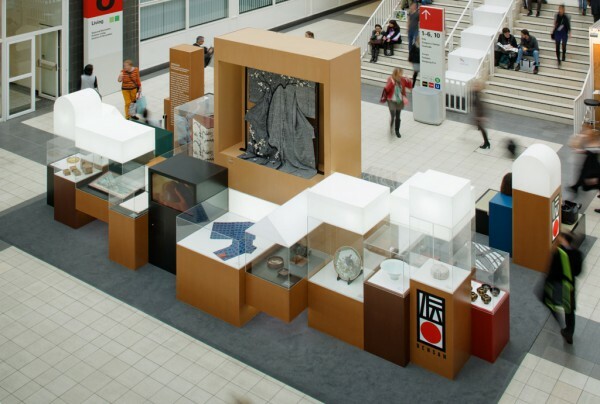 For consistency, we reconstructed similar display stands in Hall 9.0 using the same elements found in the Galleria. 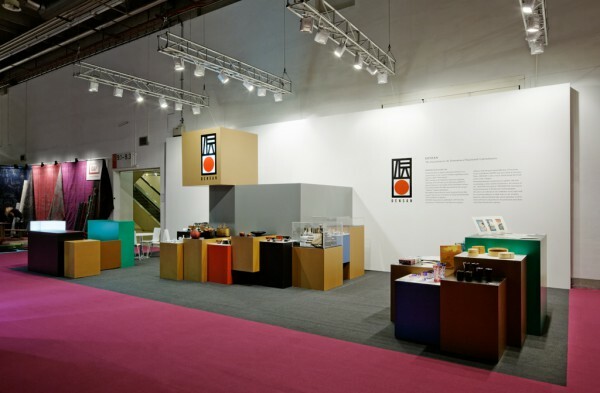 Moreover, while the two exhibition areas are removed from each other, they are complementary and possess the same communicativity. 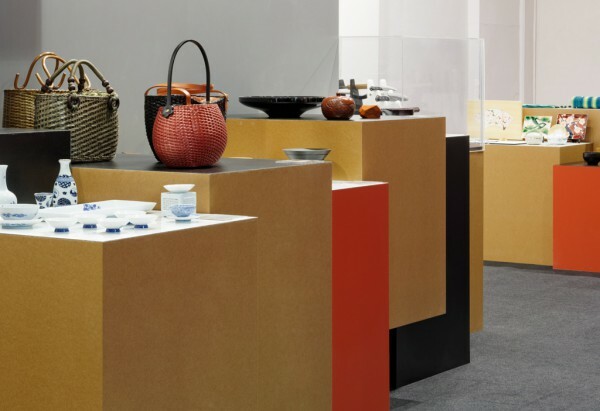 The display stands, which bring together a variety of colors and shapes, impart a feeling of unity to the resulting lively scenery resembling a block of buildings and seek to create a space where one can come face to face with each of the traditional craft on display without haste.